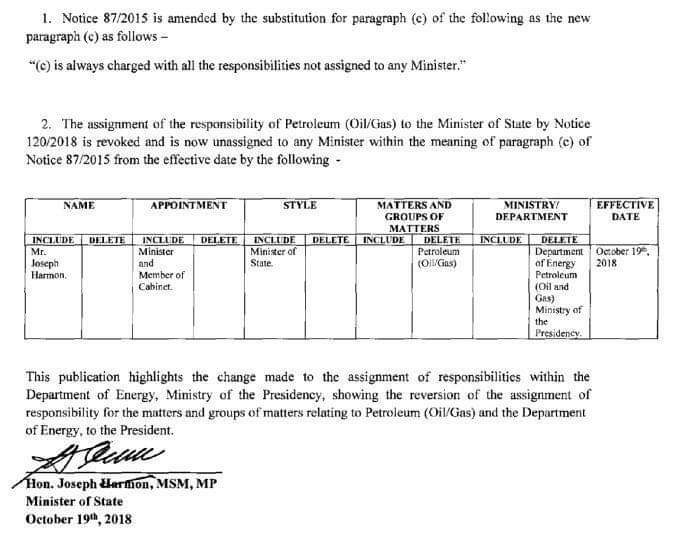 Two days after Minister of State, Joseph Harmon rebuffed a Demerara Waves Online News report on responsibilities for Guyana’s oil and gas, the Official Gazette has been changed to now show clearly that only the President and no minister is in charge of that sector. In an October 19. 2018 notice of the Official Gazette, Harmon is no longer responsible for matters and groups of matters related to Oil and Gas, and the Ministry of the Presidency’s Department of Energy. The gazette says the oil and gas sector is now “unassigned to any minister”. “This publication highlights the change made to the assignment of responsibilities within the Department of Energy, Ministry of the Presidency showing the reversion of the assignmemt of responsibility for the matters and groups of matters relating to Petroleum (Oil and Gas) and the Department of Energy, to the President,” states the amendment to notice signed by Harmon. That notice was published in the October 27, 2018 edition of the Official Gazette. Minister of Business, Dominic Gaskin has been seen publicly representing the Guyana government in oil and gas matters. President David Granger in early October 2018 had written to several oil companies informing them that he (Granger) was now responsible for the sector in keeping with the Petroleum Act. “I am directly and solely responsible for approving exploration and production licences, work plans and local content plans; decommissioning and monitoring and adjudicating, where appropriate, compliance with the laws and regulations, inter alia, of the Cooperative Republic of Guyana,” Granger said in a letter seen by Demerara Waves Online News. In August, when oil and gas sectoral responsibilities had been officially shifted from Minister of Natural Resources, Raphael Trotman to the Department of Energy, Harmon had been listed as the gazetted minister.